Spanish Import – Stella Nova is an ensemble of passionate musicians moved by a common interest in ancient culture and music. Inspired by the work of the foremost Italian and foreign medieval music groups – those who stay true to historical medieval music through extensive research of paleographical, iconographical and organological sources – Stella Nova musicians want to contribute to the rediscovery of medieval music and to the spirit with which to make this music today. Stella Nova transmits the medieval era with interpretive fidelity and uses accurate reconstructions of period instruments often obtained on the basis of precise iconographic references. The Hexperos connection Both of the core members of Hexperos are on this album. The credits list both Alessandra Santovito (voice, flute, percussion) and Francesco Forgione (harp, percussion, bells). Hexperos is essentially a duo with guest musicians, so these two are sort of the Brendan Perry and Lisa Gerard of the operation, if you will. 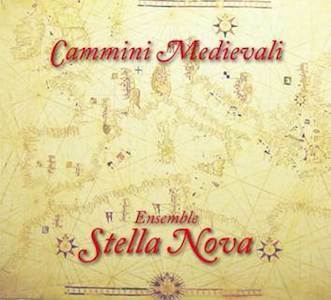 Cammini Medievali (Medieval Paths) takes the listener on an ideal musical journey through medieval Europe which starts out from Spain, passes through France, and then arrives in Italy with songs that are significant from the musical repertoire of the period. Though the Middle Ages covers a very wide time span (from about 1000 a.d. to 1400 a.d.), only a small part of the musical production from the period has been passed down to us today and often it has been transmitted only orally. The music in Cammini Medievali is both sacred and secular. The songs are taken from manuscripts, collections and codes that have fortunately been preserved over time and handed down to us. The instruments used by Stella Nova are accurate reconstructions of period instruments, taken from drawings found in medieval manuscripts,and in bas-reliefs, frescoes and iconography.